Hasbro Takara Tomy cwc 12" Neo Blythe Doll "Cherry Beach Sunset. Hasbro Neo Blythe Doll Cherry Beach Sunset. 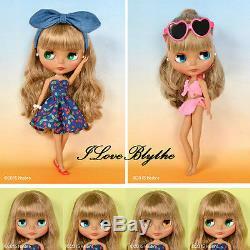 Lets start Summer with our lovely tanned Neo Blythe Cherry Beach Sunset. Cherry Beach Sunset sits under the shining sun on a sandy white beach along side the deep blue sea. She spends her day relaxing by collecting seashells and reading in the shade of a palm tree. She wears a cute bikini and a lovely sundress. They can be worn together or separately. The halter top bikini has a cute tie strap in the front, its paired with a skirted pair of bottoms for a fun and sassy beach look. She comes with heart shaped sunglasses in pink frames. Her lovely sundress is dark blue with bright red cherries all over. Shes got great accessories like her heart shaped earrings and white bead bracelet. She comes with a fun denim hair band that can be worn with both the dress or swimsuit. She comes with red flat shoes that match perfectly with the cherries on her dress. Her hair has a slight perm with straight bangs. She looks good with her hair up high in a ponytail or worn down. She wears brown eyeshadow, pink cheeks and bright coral lipstick. She has a special emerald color eyechip that is front facing. Her face is Radiance + with mocha colored skin. Face Type: Radiance + Skin Type: Mocha Make-up: Brown eyeshadow, coral pink lips, pink cheeks Eye Color: Special Emerald Green (front), then stock colors. Hair Color: Light Brown Earrings: Yes The set includes: Doll, swimsuit, dress, hair accessory, sunglasses, shoes, bracelet, and stand. Release Date: July 17, 2015. ITEM IS MINT IN ORGINAL SEALED PACKAGE 100%brand new NEVER BEEN OPENED Around 12 tall. View all items in my sdGallery. The item "Hasbro Takara Tomy cwc Neo Blythe doll Cherry Beach Sunset" is in sale since Thursday, June 29, 2017.